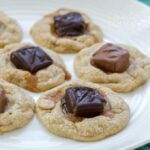 These candy bar cookies are easy to make and are super chewy and delicious! Peanut butter fans will go crazy for these candy bar covered treats! Preheat oven to 350 F. Line an insulated baking sheet with parchment paper. Cream butter and sugars until well combined. Add eggs and beat until fluffy. Add peanut butter and beat until well combined. Stir or whisk together flour, baking soda and salt. Add to creamed butter mixture and mix well. Stir in peanut butter chips. Roll into balls or use a cookie scoop. Bake for 10-12 minutes (mine took 11.5 minutes). Remove from oven and leave cookies on cookie sheet for 2 minutes to rest. Remove from parchment to cooling rack to cool completely. This recipe for Candy Bar Cookies was printed from AmandasCookin.com - https://amandascookin.com/candy-bar-cookies/ and can only be printed for education or personal use.